Bulldog senior eyes college career after dominant run in high school. FARMINGDALE — Taylor Harmon knew Jon Whitcomb could be great. Even before Whitcomb knew it himself. The late Cony High School track and field coach was an assistant at Hall-Dale when he first started working with Whitcomb, an up-and-coming high jumper. But Harmon saw a track and field renaissance man in the freshman, and had him try his hand at hurdles his sophomore year. And then at pole vault. And then at discus. It couldn’t have worked out better for the Hallowell resident. Now a senior, Whitcomb has evolved into a four-event standout, rewriting the Hall-Dale record books and taking aim at a productive college career. He heads into the Mountain Valley Conference championships Thursday at Lisbon High School (the Kennebec Valley Athletic Conference championships are Saturday in Bath) holding school marks in the 110 hurdles (16.86 seconds) and high jump (6 feet, 3 inches) and a tie for the pole vault (12 feet), and he’s headed to Iowa Western Community College after the summer. The decision to head to Iowa, where he’ll compete as a decathlete, is a strategic one. IWCC has a rich track and field tradition, with 22 alums in the Olympic trials, four in the Olympic Games last year and a reputation for sending athletes on to Division I schools, and Whitcomb is hoping to follow that path. Coach Jarod Richmond said Whitcomb’s talent has been allowed to flourish due to his dedication to the sport. 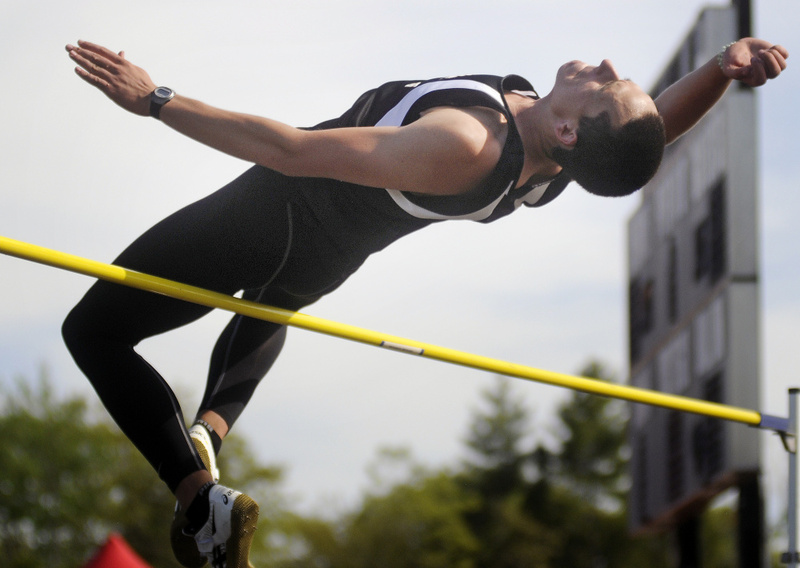 The interest was always there, ever since he first started high jumping in sixth grade, but Whitcomb hit a wall in high school. He stopped winning at meets, and Harmon could see that Whitcomb would be better served trying to be good in many events rather than great in one. As Whitcomb’s track reportoire expanded, so did his commitment. He trained for track and field under Harmon’s watch eight to nine months of the year, doing double sessions every weekday of the summer after his sophomore year. The two became so close that Whitcomb saw Harmon nearly every day before he passed away in October 2015, even frequently going to the coach’s house for dinner. Harmon’s passing didn’t diminish Whitcomb’s desire, nor did it slow his progression. By his junior year he had become a weapon for the Bulldogs, handling hefty four-event workloads at meets and turning them into a bundle of points. For Whitcomb, that drive was just second nature. Whitcomb has become invested in the teamwork aspect, however, working to recruit athletes from around the school into track and field and passing on his knowledge in practice and in meets to assist his teammates. And sometimes, he does more. He has the four events in which he competes most often, the events that he’ll be entered in in the MVCs, but he’s also competed in the shot put, the 100- and 200-meter dashes and in relays this season as he’s prepared for the demands of a college decathlete. “One of the things that we’ve done is we’ve looked at some of the decathlon events and allowed him to run those throughout the course of the year,” Richmond said. “He really wanted to be able to focus on being able to do a bunch of different things this year and really get a full scope for everything. Still to come is the challenge of proving it at the college level. But that can wait until after this season, which Whitcomb is hoping to cap off with a team championship today.